Every fighter at the world class level gets tested, in which they’re forced to prove their mental and physical durability. It’s what truly separates the good from the elite. 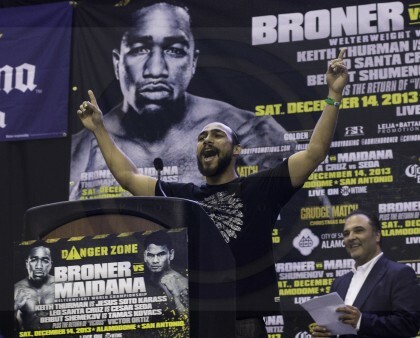 Interim WBA Welterweight title holder Keith “One Time” Thurman was given that proverbial “trial by fire” in his last outing against hard punching Argentine Diego Chaves, and passed the toughest test of his professional career with flying colors. On December 14th, in San Antonio, Texas, the 24 year old fighter insists that the boxing world will see even more from “One Time” when he steps in the ring with rugged fight veteran Jesus Soto Karass. The undefeated Welterweight showed more of his technical prowess in the ring against the formidable Diego Chaves, in which he was forced to step outside of the pocket and use lateral movement with quick, sporadic combinations to the body and head; eventually breaking down his opponent. Keith is adamant that he will display even more of his craft against an experienced and durable fighter like Jesus Soto Karass. The confident boxer/puncher is scheduled to face Jesus Soto Karass in the co-main event of a packed Golden Boy Promotions fight card, which is slated to be televised on Showtime Championship Boxing, December 14th, from the world renowned Alamodome in San Antonio, Texas.